Bed Bugs. What are they? Fun times, right? Okay, so today’s post is about how to identify if you have them. Bed bugs have been talked about on our blog a bunch of times (you can find our post about Bed Bugs and travel here, if you are so inclined), or you can just keep reading. Bed bugs are small parasitic insect, commonly compared in size to that of an apple seed. They have oval-shaped, reddish-brown bodies and no wings. The common bed bug or Cimex Lectularius, generally grow to 4–5 mm in length and 1.5–3 mm wide. It’s very important to stress that ANYONE can get bed bugs. 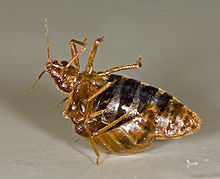 One of the biggest misconceptions about bed bugs is that they only occur in filthy conditions. This cannot be stressed enough, but that IS NOT TRUE! Bed bugs don’t care where they live as long as there is at least one human living in an environment between 32 and 120 degrees Fahrenheit then they will be happy. A few major reasons for the return of bed bugs include the ban on DDT (one of the most well-known synthetic insecticides) and other organophosphates, increased international travel, modern lack of familiarity and social stigma which results in a lack of willingness by some to request help. This entry was posted in Bed Bugs, Pests and tagged barrie, bed bugs, bedbugs, business, honey harbour, huronia, integrated pest management, IPM, midland, muskoka, orillia, penetang, pest, pest control, pests, port mcnicholl, port severn, simcoe, tay, tiny, victoria harbour by Tamara Batryn. Bookmark the permalink.